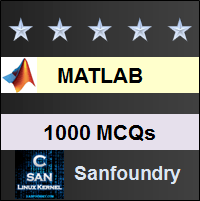 This set of MATLAB Multiple Choice Questions & Answers (MCQs) focuses on “Statistics”. 1. To exhibit time-series or spatial-series data, what kind of diagrams are suitable? Explanation: Time-series or spatial-series data would comprise of quantitative characters. So they can be represented as a Bar diagram, the height of the bar would demonstrate the quantity of a category. 2. What is the output of the following line of code? Explanation: Following the syntax of the pre-defined function pie in MATLAB, we find the length of the two arguments passed into pie(arg1,arg2) must be the same. Here, the size of arg1 is 2 while that of arg2 is 3. Hence, MATLAB will generate an error. 3. What is the difference between primary and secondary data in statistics? Explanation: Data collected directly from the field of purposeful investigation is primary data because it is directly used by the one who collects it. If the data, gathered by an agency or a person, is used by a different agency or person for some purpose- there is no direct link between the data and the person requiring it. Thus this is secondary data. 4. The nature of data while using pie plots is ___________ data. Explanation: Pie plots show the percentage, a category occupies, amongst a dataset containing several categories. Now, if this dataset is not discrete- it is preferable to use pie plot since the height of bar plots might be very close to each other to show significant changes. Hence, pie plots represent continuous data mainly. 5. What would you use to show comparisons of profit of 3 industries over 3 quarters? Explanation: The data contains 3 parameters- profit, industry, quarter. We can use the histogram plot if the profits are strikingly different but usually it is not so. So, we should use Bar plot to draw 3 bars for 3 industries showing 3 separate profits over 3 separate quarters. 6. What is the difference between stem plot and histogram plot? Explanation: Histograms are used to see the frequency distribution of a variable to show the frequency of a class over any interval. So, naturally, a variable cannot repeat with a negative frequency. Stem plot only relates the two arguments it gets in terms of their projected values. So stem() can have negative values. Explanation: A bar graph is used to show the contribution of 3 batsmen with one batsman in a partnership. Thus it can be inferred who has contributed highest to the partnership among the three. Explanation: The angle histogram graph plots a histogram circularly. So, viewing the field as a circle, one can easily find the area in the field where the batsman has scored the most runs. Explanation: The function ‘plot3()’ is used to plot a 3d graph. The axes of the system can be mentioned as x,y,z so the plot which will be returned will be for a cube if the length cut off from each axis are equal. 10. To specify different curves in an angle histogram plot, we use the _________ function. Explanation: The legend function is pre-defined in MATLAB. It is used to print the names of the curves present in a plot. The function is the same for both 2d and 3d plots.